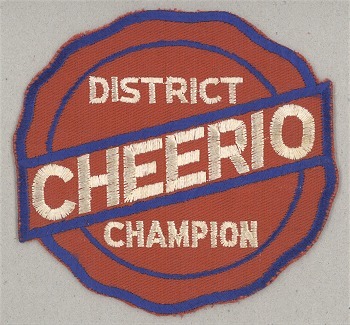 This patch commonly came attached front and center to the Cheerio vest sweaters, which were also used as awards at contests. District Champion patches were definitely offered for higher levels of competitions. This is a well known patch that many Cheerio competitors aspired to win. Traditional colors, and with scalloped edges, just like the stickers on many of the Cheerio Yo-Yos.